Honeywell says its CT87K model thermostat has a place on the wall in more of the world's homes than any other make or model. 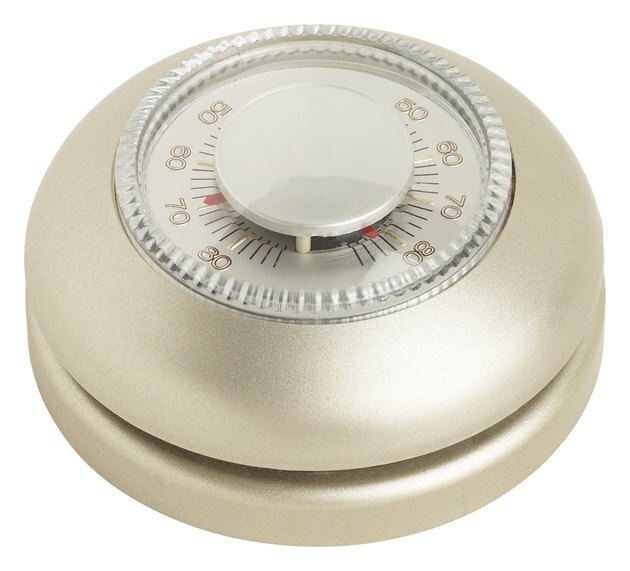 The understated round white device has two temperature bands, one for the setting and another giving the room temperature. It does not have any of the features of the newer programmable temperature gauges with digital displays, and it can only run a furnace. In fact, it only takes two or three wires to connect the CT87K, so even troubleshooting options are limited. The Honeywell CT87K is old school, with no backlighting or digital readout. Confirm you have the device wired correctly. The CT87K is only for limited setups; most thermostats will control a furnace with a red and white wire, while a third wire can connect to the "Y" terminal when a system supports hot water heat. If you have additional wires coming from the wall at the back of the thermostat, you will need to replace the CT87K with a device offering more terminals and controls. Examine the internal components of the thermostat. Even though the CT87K is compact and sits flush against the wall, it may have been struck accidentally during a child's game or while moving furniture. Check for broken plastic and wires, loose screws or foreign matter. Check for any unraveling of the bimetal coil, a curled strip made of two metals that expand at different rates and determine room temperature. Unraveling can occur as a result of damage or age. While screws can be tightened and dust or debris removed, any damage to the unit uncovered during troubleshooting likely will require the installation of a new thermostat. Turn the dial on the face of the CT87K to increase the temperature setting. This troubleshooting step confirms whether the furnace is receiving proper activation instructions from the thermostat. A click at the thermostat generally indicates the connection has been made; if the blower does not kick on, it may indicate more significant issue with the furnace itself. Determine whether the thermostat's room temperature reading is being affected by appliances or drafts. Take temperature readings in various parts of the home to find any significant discrepancies. Turn off heat sources near the thermostat, like an oven or heater, to see whether the temperature drops or the heat will turn on. If the furnace will not shut off, make sure windows and doors near the CT87K are closed and locked to prevent drafts. If troubleshooting cannot resolve the issue, consider relocating the thermostat to another central spot inside the home. Trevor Wendzonka is a public relations specialist based in the Midwest. He worked for a 30,000 circulation newspaper for 15 years as a sports and government writer, and spent a number of years editing and designing pages on the copy desk.